Embed social content and engagement in your CRM or contact center for social customer service and lead generation. Out-of-box integration to apps like Siebel, CRM On Demand and Salesforce.com. Or easily build your own integrations using the Buzzient Social API. Separate, outboard social applications are not the way to increase value in your enterprise software assets. 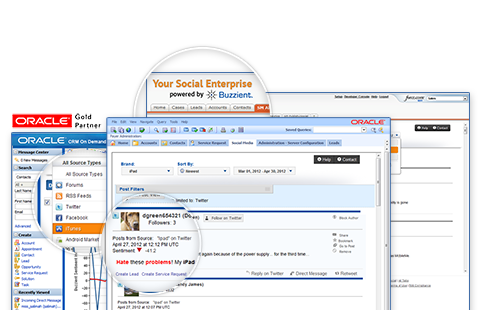 With a single Buzzient system you can easily integrate Social Media within the many applications across your enterprise. Embed Social Media in your existing business processes and automate social actions across your enterprise apps. Increase customer satisfaction, revenue and loyalty by leveraging Social Media.